When trying to lighten your backpacking load, it’s difficult to find a better option than tarp camping. Tarps come in a variety of sizes, shapes and lightweight materials, and there are dozens of do-it-yourself, easy-to-construct tarp shelter configurations for the minimalist in all of us. Here are the basics you need to know to get started – tarp camping 101. When it comes down to tarp vs. tent, camping with a tarp has may advantages. First, tarps are lightweight and take up less space in your pack. This can be crucial on long days of hiking. Tarps are also versatile backpacking tools. They can block wind, trap heat from a fire, cover you from rain, or keep you off of wet ground. Finally, because a tarp shelter doesn’t provide a wall between you and the natural world, you sense a deeper connection to nature, and isn’t that why you are here? On the downside, a tarp shelter doesn’t provide a wall between you and the natural world. 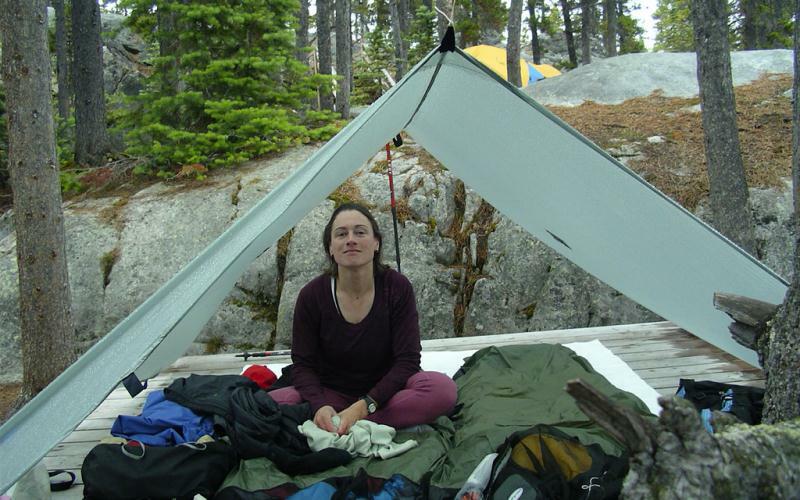 Tents keep the bugs out, trap warmth in winter, and provide privacy. With a tarp, you are more exposed to elements such as wind, rain, and dampness. 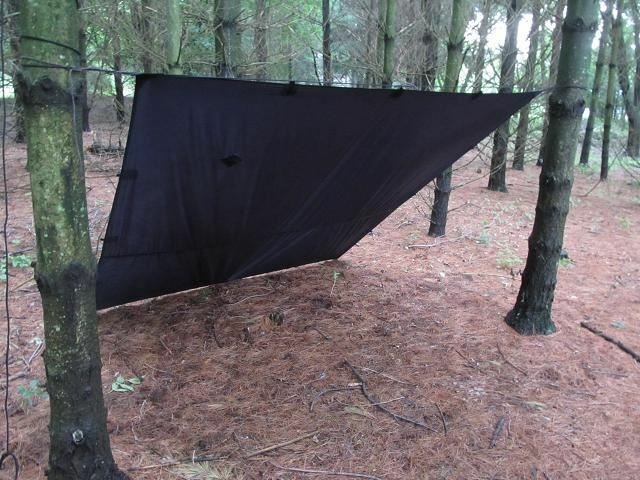 Finally, depending on terrain and vegetation, hanging a tarp can be a challenge. 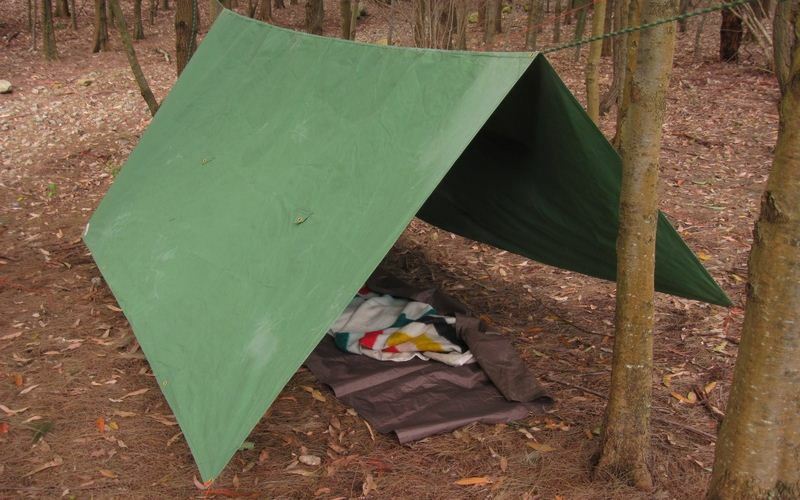 While there are many ways to configure a tarp, here we will look at three basic styles. This is one of the simplest configurations to set up. All you need is a square or rectangular tarp, about 20 feet of cord or two trekking poles, and at least four tent stakes. If there are two conveniently spaced trees, simply tie the length of cord between the two trees using sliding knots to create tension. This is known as your ridgeline. Next, you drape the center of the tarp over the cord and stake out the four corners. 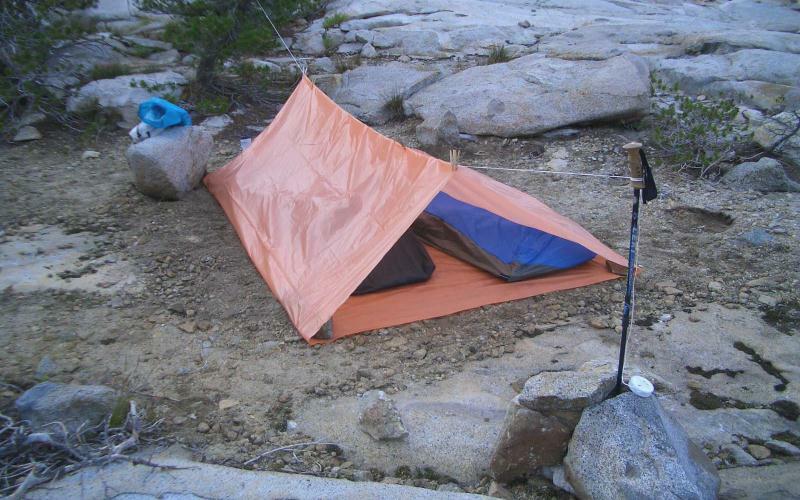 If you are in an area without trees, you can use trekking poles to hold up the center of the tarp. If you turn your poles upside down, you may find that the tips fit through the tarp’s grommets, making them less likely to slip during the night. It is important to note that with all of these configurations, the closer the tarp is to the ground, the more protection from the elements it will provide and the better it will trap heat. You’ll have to decide what you are willing to sacrifice in headroom to do this. Another basic configuration is the Lean-To, and it can be created using the same basic equipment as the A-Frame. Here, you set up your ridgeline just as before, but instead of hanging the center of the tarp over it, you attach one of the edges of your tarp. Next, pull the tarp tight and stake the opposite edge to the ground. Again, trekking poles can be used in place of a cord or rope. It’s a bonus if you can place the open end of your tarp against some sort of natural protection, such as a rock wall or bushes, to provide extra protection from wind and rain. If you want to have a layer of tarp underneath your sleeping pad and sleeping bag, the tube tent is a solid basic design. This set-up is best with a rectangular tarp, and again you’ll need the cord or poles and tent stakes. Rig the ridgeline cord between two trees. Starting from one of the narrow sides of the tarp, drape the tarp over the ridge line at the 1/3 point. Continue 1/3 of the way down the length of the tarp, and stake it to the ground. Fold the remaining third back underneath the tarp, staking both ends to the ground. To successfully configure your tarp and ridgeline, you’ll need to know some basic ropework and knots. This video is a great introduction to basic tarp knots, and offers step-by-step instructions for tying knots that are easy to make, strong, and easy to open. You’ll learn to tie a bowline knot, a truckers hitch, a Prusik knot, and a double fisherman’s knot. Tarps are best used when pitched on flat ground in moderate winds. Consider wind direction when orienting your shelter. Avoid setting up in a depression or ditch. If you have a preferred tarp configuration, prep your tarp at home.